Celebrating our 15th year of environmental education year-round for both Island community and its visitors. 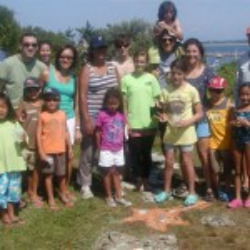 The Ocean View Foundation educates visitors and islanders on the natural history and beauty of Block Island. We encourage the celebration of its maritime culture, vernacular architecture and preserved open space. The Foundation has preserved four-plus properties on the Island. The most visible and the first project encompasses a little over an acre, on a beautiful site, overlooking the Old Harbor. It was once the grounds of a grand late 19th century Victorian hotel. The Ocean View Hotel was originally created as a swell destination for long summer holidays. Now all that remain are the low stone ruins of its foundation. By acquiring this commercial land and protecting it from development, the Ocean View Foundation has created a new destination providing views, rest, peace, and quiet. 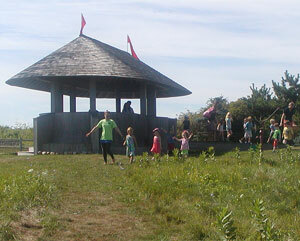 On the meadow now stands a small open-air pavilion, completed in 2000, which is open to the public from dawn to dusk. The newest addition to of preserved properties was the acquisition, in 2014, of a small parcel adjacent to the Pavilion site that also borders the east end of Water Street. This parcel, once part of the original Ocean View Hotel land, was used, at one time, as a fuel/gasoline depot and as a pumping station. Now that this commercial lot has been rejoined to the Ocean View site it will increase the area available for purposes of rest, views, and environmental education. In addition to the public open space provided by the site above in the Old Harbor, three other properties have been preserved on the west side of the Island overlooking 10 wild acres of protected land with 2 ponds and a rocky coast. A simple cottage built in the 1840s by a fishing and farming family was reconstructed and restored in the summer and fall of 2001, with additional renovations done in 2008. The house is a model for building in scale with the Island's cultural heritage, and in preserving the inherent spirit of making due with what is available. Much of the house was originally constructed from material washed up on shore. In its new life electric and hot water energy come from the sun as much as possible, through photovoltaic and solar hot water panels. Another is a two-acre property with a single story home built in the 1960s. The original structure has been saved and moved to a different site on the property allowing for a second home finished in 2007. This house has been built utilizing the latest in green and sustainable building principles, and provides year-round housing for a young BI family and summer employee housing for the foundation. The original house renovation, also with green sustainable building practices, provides year-round housing for a second year-round family. The third parcel, on the west side of the island, is adjacent to the year-round housing parcel. This lot is currently open space, and is acting as a "nursery" for young white oaks which have self seeded from several large oaks on the site. This site is a typical example of glacial morainal grassland or nobs, with low-nutrient soil and plants adapted to poor soil and little water. 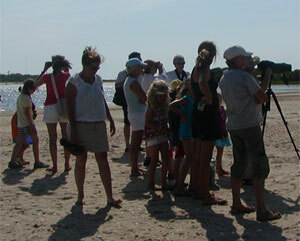 The foundation has also produced five films: "A Block Island Conversation" (2002), introducing visitors to the Block Island community, "Block Island Rescue" (2003), telling of the long history of sea rescue as well as bird study on the Island, and "Block Island Blankie" (2004) which illustrates the path of trash & treasures traveling from a BI recycle bin to the off-island Rhode Island Resource Recovery Center in Johnson, RI. BI Shuffle, (2007) discusses the problem of affordable year-round housing for the islanders. "Block Island Wind" (20--) is a silent film showing Block Island from a birds-eye-view. This film runs with a series of 20 questions about the island that can be answered "for the fun of it". All five films are now available on one DVD. These films can be seen on the passenger boats of Interstate Navigation sailing from Point Judith to Block Island during the "visitor season." In 2004, OVF introduced the Footprint Film Festival. This program of film presentations focused on issues addressing the human footprint on earth with the theme of Garbage. "Block Island Blankie" was introduced at the festival and the winner by popular acclaim was “Flip Flotsam (www.journeyman.tv). Films continue to be an important part of Ocean View Foundation's programs. Each winter the Foundation runs a monthly environmental film series with the Island Free Library, and there is a weekly summer program of film presentations - Green Screenings. The OVF is host to annual community events held at the Pavilion: Earth Mother's Day in May and a Community Pot Luck in October. During the summer, the Pavilion is the venue for a weekly schedule of programs that include a Nature Walk around the site, Bird Banding, and an Art & Nature drawing program. (See Program Schedule for the latest offerings). During the quiet season Block Island students are invited on a one-day trip off the island. These excursions have included outings to the Manshantucket Pequot Museum and Research Center in Norwich, CT, the Audubon Society of Rhode Island’s Environmental Education Center in Bristol, and the Mystic Aquarium in Mystic, CT. Finally, an old Block Island tradition has been reintroduced – The Community Bird Census – and is held annually on December 26th.